Especially designed for quick and efficient weeding, whether pushing or pulling through soil.5-inch x 2.875-inch head; 5-foot overall length. A traditional style Dutch hoe with a 5-inch wide blade that delivers smooth and easy use. The blade is designed to be pushed or pulled through the top layer of soil, removing weeds and loosening soil with minimal effort. The long handle is made from ash, which comes from a sustainable source. Remove weeds with ease! Ship weight 3 pound. 5" wide x 2 and 7/8" blade 60" long overall. If you have any questions about this product by Clarington, contact us by completing and submitting the form below. If you are looking for a specif part number, please include it with your message. 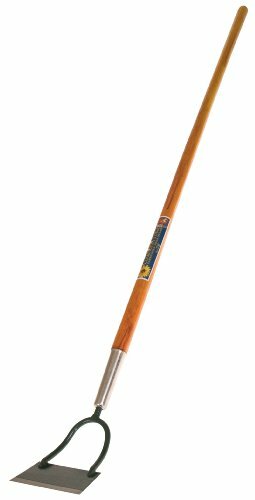 LywHOME Japanese Garden Tool - hand hoe/sickle is perfect for weeding and cultivating. The blade edge is very sharp.